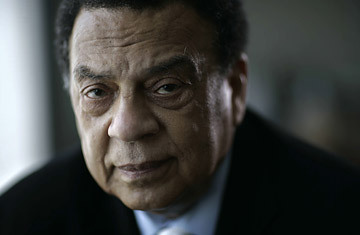 By 1968, Andrew Young had spent the prior few years traveling from city to city, mediating between black and white communities, registering people to vote and helping to run the operations of the Southern Christian Leadership Conference. All of this in response to Dr. Martin Luther King's call for freedom and equality. But when King went to Memphis, his march was disrupted by a youth gang that Young says had claimed they were paid to do so. "But that violence was what upset Dr. King the most, and it meant that instead of going to Memphis and coming back to Washington, it meant that we had to go down to Memphis," Young recalled. King wanted to do it right. He wanted to show that demonstrations work best when they are done non-violently. So back to Memphis he and his aides went. The city of Memphis got an injunction against the SCLC to prevent the second march from taking place. Young had spent all day in court fighting the injunction and returned to the Lorraine Motel. His friend was preparing for dinner, then a rally later that night. The mood was light. Young says that King was not as melancholy as he had been previously. He even engaged Young in a pillow fight when he joined the group at the motel. King came out of his room onto the upper balcony. Young was below in the parking lot. "And I said 'You know, it's cool, and you've had a cold. You better go back and get your topcoat. And he was saying 'Do I really need a coat?'" "I don't even think he heard the shot. I don't think he felt anything," says Young. Young went on to became a U.S. Congressman, mayor of Atlanta, a United Nations Ambassador and is now co-chairman of Good Works International, a consulting firm. He says King's influence and the movement he started continues to be felt. "It inspired success in a broad range of men and women of goodwill in the world. It inspired success, I'm sure in South Africa, but...also...when the Polish freedom fighters were standing up against communism, they followed our non-violent traditions. When the Berlin Wall came down, they were singing 'We Shall Overcome.' The same thing was true in Tiananmen Square, so there was a global movement. In fact, it was global before we got in it because all of us learned it from Gandhi." He said King would be surprised at the progress that has been made over time, although there is much more to do. "Freedom is a struggle and we do it together. Not only together as black citizens, but black and white together," says Young. "Martin Luther King talked about a Coalition of Conscience, or a Coalition of Goodwill  people of goodwill who want to change the world for the better. I think you see evidence of that."